MIAMI, Florida (CNN) -- Two men seeking paternity rights to the 5-month-old daughter of Anna Nicole Smith said Thursday they have agreed Smith should be buried in the Bahamas, next to her son Daniel. The men made the announcement to reporters a few minutes after a tearful Broward Circuit Judge Larry Seidlin awarded custody of the body to Richard Milstein, guardian ad litem of the infant, Dannielynn. Arthur had wanted to bring Smith home to her native Texas. Smith died February 8 in a Florida hotel, but the cause is still unknown. In handing down his decision, Seidlin directed Milstein to consult with Howard K. Stern, Smith's partner and lawyer at the time of her death; Larry Birkhead, Smith's former boyfriend; and Smith's mother. Shortly after the ruling, it appeared all the parties had agreed to a burial in the Bahamas. Arthur stood with Stern and Birkhead as they announced their agreement to reporters. Stern and Birkhead both claim to have fathered Dannielynn. 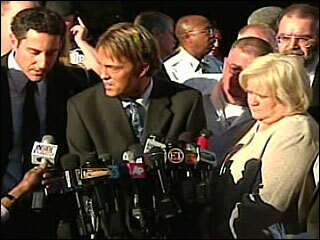 "I'm very grateful that Anna Nicole's wishes are going to be carried out," Stern told reporters outside the courthouse. "That's all that matters." Said Birkhead: "We all loved Anna and it's in her best interest to come together." Broward County Medical Examiner Joshua Perper predicted the appeal would be dismissed in short order. "Probably in a day or two there's going to be a final decision," he told reporters. "So we'll be able to make the arrangements." Perper said Seidlin had asked him to accompany the body to the Bahamas to ensure the burial is carried out properly. Perper said he would comply. In addition, the consulate for the Bahamas must approve any transfer by certifying that the body is free of infectious disease. Until then, the body -- which Perper said is in "excellent condition" -- is to remain with the medical examiner's office. Perper, who carried out the autopsy, said it will likely take another 10 to 14 days before he can determine the cause of death, but expressed confidence he would be able to do so. Thursday's decision does not mean that legal issues related to Smith will end soon. Birkhead's lawyers filed a motion in a Florida family court asking for an emergency hearing to be held Friday morning to request that a DNA sample be taken from Dannielynn. 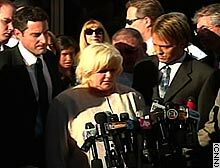 Howard K. Stern, Virgie Arthur, and Larry Birkhead talk to reporters after the ruling in a Florida court. Do you think the decision to award custody of Anna Nicole Smith's body to her daughter's legal guardian was the right one?